I wasn't ready for Zion National Park, but Zion was ready for me. To surprise me. To push me. To make me stop and wonder. After driving by on Interstate 15 several times, we finally planned a weeklong camping trip that included a day in nearby Bryce Canyon. It was one of those trips planned so far in advance, I almost forgot about it. When I did remember, I didn't give it much thought because I was too busy wrapping up loose ends before we hit the road. So, I arrived with no real idea of what to expect. Zion's first surprise was how close it was, a little more than two hours past Las Vegas. Another surprise? The crowds. Getting into to the park is like getting into Disneyland. One primary two-lane road carries millions of annual visitors into the tiny town of Springdale and deposits them at the Visitors Center. Parking is limited past that point, so almost everyone entering the park lines up to catch a shuttle. The best surprise of all, however, is that after standing in line for two hours to pay admission, catch the shuttle and finally dismount at the Weeping Rock stop, it's still possible to find a moment of solitude. While my daughter Brooke waited in the 19-person-deep line for the restrooms, and the rest of the family headed up the trail to look at Weeping Rock, I took a seat on the edge of the walkway above the creek. The surrounding crowds faded as I squinted to take in the towering red cliffs backed by the vibrant cloudless sky. The noise of people was lost among birds calling from somewhere above, and the splash of water passing around the rocks in the creek below. "RED SANDSTONE WALLS reach more than a thousand feet high, while the walls squeeze down to 20 or 30 feet wide. The sky above is just a twisting blue ribbon. Every bend in the river brings another surprise." Content to be still after so much rushing, I could have sat for hours just studying the canyon. No matter how many times you look, you'll always notice something new. Shadows. Contours. Details. The variations are endlessly fascinating. But the canyon isn't just for sitting. It begs for exploration. And that's where Zion pushed me. The park's iconic hike, The Narrows, is a daylong exploration of the gorge carved by the Virgin River. The only way to see it is walking through the river. Clad in Gore-Tex dry suits and river shoes rented from Zion Canyon Adventures, we waded into the water. We picked our way upstream for 2.5 miles, relying on our wooden walking sticks for balance as we worked against the current and guessed at where we were stepping underwater. Red sandstone walls reach more than a thousand feet high, while the walls squeeze down to 20 or 30 feet wide. The sky above is just a twisting blue ribbon. Every bend in the river brings another surprise. New colors on the canyon wall. A solitary plant clinging to the rock. Birds darting along just overhead. 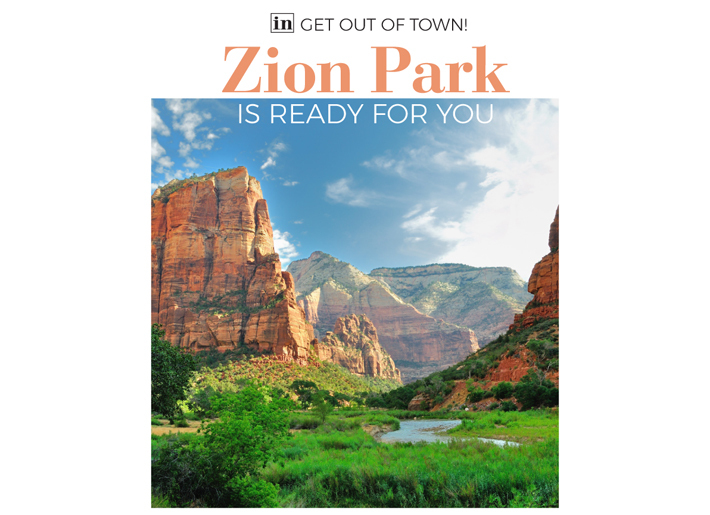 Zion has the power to make you stop and stare. Literally. On our way back from Bryce Canyon, we inadvertently timed our return with moonrise. After passing through the famous tunnel on the Zion-Mount Carmel Highway, we saw the full moon illuminating the canyon walls as we descended the road's curving switchbacks. There was no light pollution to diminish its radiance. We pulled over, turned off the lights and stood outside the van savoring the experience. Although we spent a week in the park, I would go back. This time to Zion Lodge in the middle of the canyon. Staying there means you can drive straight to the lodge, bypassing the shuttle and then walk from your room or cabin to some of the park's most scenic trails. Eric Harnish lives in Castaic, where you can find red rocks if you know where to look.